Bianco, NoFit State Circus, Directed by Firenza Guidi, Ozone Reserve, East Perth, Until March 1. Audiences expect more from contemporary circus than pure spectacle and NoFit State Circus, founded in the UK in 1986, delivers in spades. In Bianco, the big top becomes a moveable feast, with the performers adjusting mobile scaffolding to create different sets and apparatus, and the audience corralled around the tent to accommodate the action. This device really draws you in to the event, as does the live music, which together with Firenza Guidi’s inventive direction, gives Bianco a more theatrical ambit than most circus aspires to and delivers a context for the athleticism and grace of the performances that can really pack an emotional punch. A double trapeze routine becomes a sensual song of heartbreak and consolation. A muscular sequence on aerial straps soars and dives into the flames of memory. Strenuous acrobalance is a vehicle for a clownish take on obsession with appearance. Trampolining acts recall the freedoms of youth, and graceful juggling stands as a metaphor for the transience of the present. 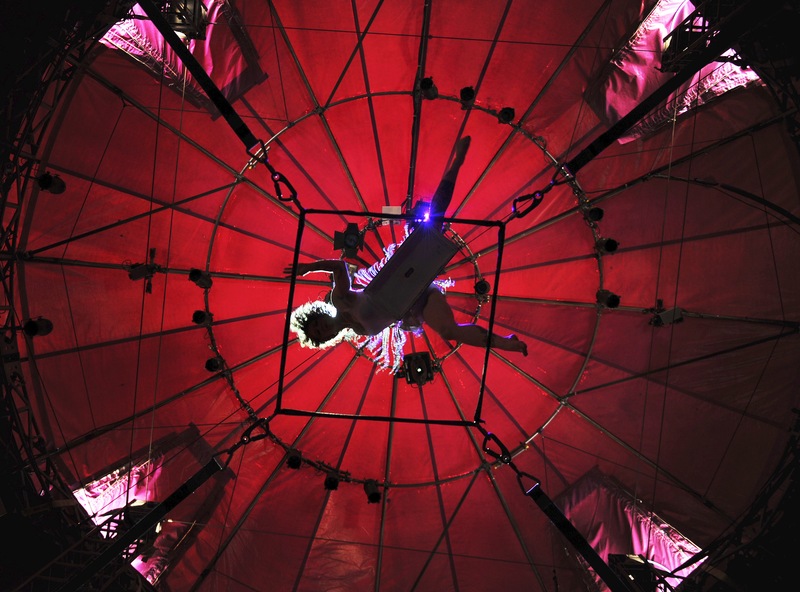 There are some terrifically innovative visual surprises and almost every circus discipline works its way into the show. The ensemble demonstrates a level of skill, trust and enjoyment in performance that it’s impossible not to wonder at. Only one moment in the evening – a full company free-for-all over the mountainous set – looked a bit unchoreographed and didn’t justify itself dramatically. Otherwise, it’s a solid two hours of superior circus that will dazzle and delight. 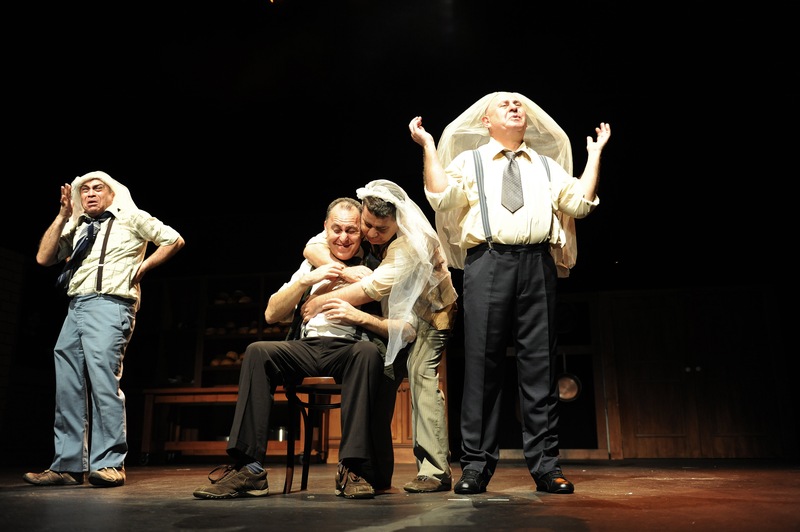 Not By Bread Alone, Created by Adina Tal and Nalaga’at Deaf-Blind Theatre Ensemble, Directed by Adina Tal, Performed by Rafael Akoa, Itshak Hagay Hanina, Nurani Levy, Zipora Malca, Igor Osherov, Bat Sheva Rabansari, Shoshana Rozilia Segal, Evgenia Shtesky, Yuriy Tverdovskyy and Mark Yaroski, Regal Theatre, Until Feb 12. The Nalaga’at Deaf-Blind Theatre Ensemble is the only theatre company of its kind in the world. “Nalaga’at” translates as ‘Do Touch’ and refers to sign language performed through touch – sometimes the only way deaf-blind people have of communicating with others around them. During the show, the masks fall to reveal the individual stories and quirks of each performer, their hopes and fears. It isn’t all biographical, by any means, and reflections on life in a world of silence and darkness are spliced with amusing interludes. Wistful monologues from performers who can recall the experience of vision and hearing jostle with richly articulated comedy – a whimsical sequence in a high-class hairdressing salon, for instance, or a lively slapstick double-act in the mould of Laurel and Hardy. Just as important to the performance are the translators who assist the actors to move around the stage, vocalise the signed dialogue and translate into English the spoken elements of the show. There’s a temptation – best avoided when reviewing performers with disability – to lower the bar, or to marvel at courage in adversity, rather than concentrate on the artistry. That’s patronising in the extreme, and the best parts of the show stand tall on any measure. What is true is that the desire to communicate lies at the heart of this piece, and Adina Tal’s achievement is to shape it into the kind of communion between actor and audience so essential to great theatre. Not By Bread Alone will make you reflect on the difficult pleasures of self-expression. It asks you to unlearn some common preconceptions about sensory disability, and opens a window into a ways of being in the world that seem at once strange and utterly familiar. Mies Julie, Written & Directed by Yael Farber, Set: Patrick Curtis, Sound: Daniel & Matthew Pencer, Performed by Hilda Cronje, Bongile Mantsai, Thoko Ntshinga and Tandiwe Lungisa, Baxter Theatre Centre at the University of Cape Town/ South African State Theatre, at the Octagon Theatre, University of Western Australia, Until Feb 13. 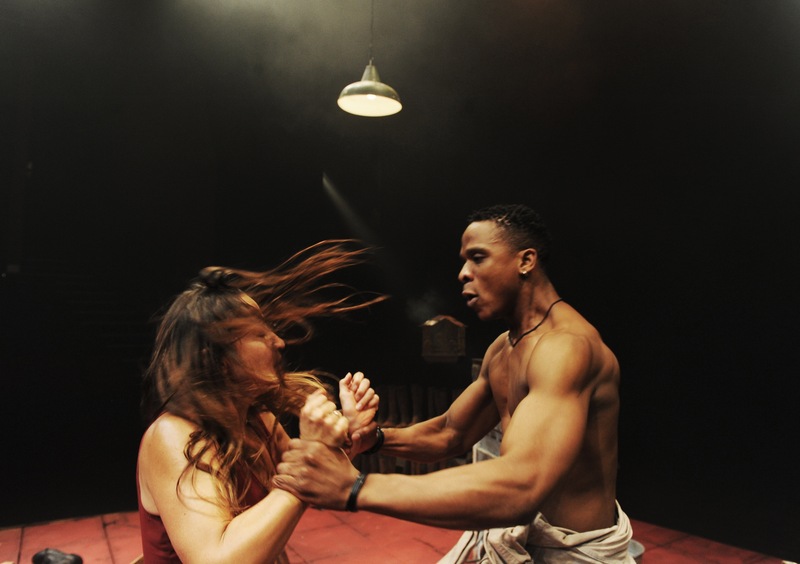 One highlight of the Perth Festival this year is a superb, emotionally devastating production of Mies Julie that adapts Strindberg’s torrid battle of the sexes to the plains of post-apartheid South Africa. There has been much discussion in Australian theatre circles lately about the rights and wrongs of rewriting canonical drama, and it’s a pleasure to see such an exemplary instance of the craft. In Strindberg’s play, love and lust are confused – and desire itself perverted – by social forces beyond the lovers’ control, and Yael Farber’s stroke of genius is to find a complex analogue to the stultifying class system and patriarchal mores of 19th century Sweden in the legacy of racial servitude and hostility to women in the Karoo, a rural part of South Africa still dominated by the injustices of the past. Farber’s version is set on a homestead (aptly named Veenen Plaas or ‘Weeping Farm’) owned by Julie’s father. The farm has fallen into desuetude, and evocative stage design from Patrick Curtis instils a sense of entrapment as well as the precariousness of life against the harsh land and the terrible freight of history: a treestump emerges through cracked terra cotta tiles, a birdcage swings, a fan revolves in air stagnant before a storm, and the red dust of the veldt peeks out from underneath – implacable, hungry for blood. Both Julie’s ancestors (she is descended from the Voortrekkers) and her lover John’s (an indigenous South African) are buried in the earth nearby, sharing a common fate. And the most significant departure from Strindberg’s text involves the spirit of John’s great-grandmother (Tandiwe Lungisa), whose mournful presence and traditional songs haunt the action. Against that spectral quietude, the lead performances rage like wildfire, savage and stunning. John (Bonglie Mantsai) and Julie (Hilda Cronje) capture Strindberg’s volatile emotional register and cruel power plays to perfection. Both actors seethe with a doomed eroticism that’s utterly compelling to watch. Unmanned by a life of exploitation, poverty and the constant threat of violence, John’s desire for his master’s daughter keeps running into a psychological wall – one Julie is determined to break through aggressive cockteasing, demeaning John’s masculinity, and racist abuse. John, for his part, transforms from tormented to tormentor with dark inevitability. After their passion is consummated, he yields to monstrous sexual rage. The chemistry is incredible; the sense of John and Julie not just as doomed individuals but abject embodiments of forces in South Africa that continue to wound the present, imbues the profound histrionic intensity in the performances with a broader tragic scope. Then there’s the role of Christine, transformed in this production from John’s fiancée to his mother. A lifelong maid who has grown to love the bars of her own cage, this earthy, gentle and ultimately piteous portrayal from Thoko Ntshinga pierces to the core. It is she who has the final moment, silently reminding us that people have to find a way to go on living through the flames which consume the title character. Yael Farber’s Mies Julie is brilliant, bold and totally engrossing theatre that melds the political and the personal into a desolating whole. It would be a great shame if Perth were the only Australian city with the privilege to witness it.